SMB Marble owns quarries of Dark Green Onyx and other natural stones, therefore, has the ability to deliver the required quality of Dark Green Onyx. As having experience of more than two decades, we have a specialty in producing quality Onyx according to the requirement. Our production quality improves our valued customers’ satisfaction level. Pakistan is the only country among the few others who have the availability of onyx under its natural reserves. Usually, every landlord has the tremendous desire of getting commercial and residential buildings constructed in an artistic and wonderful way and that makes them satisfied. Pakistan is blessed by an abundance of natural minerals reserves including resources of green onyx. Light transmitting ability of Onyx really produces a striking effect. The luxurious and glamorous look of Onyx’ shiny surface is the cause of attraction for construction stone buyers. Where does green onyx come from? By having a huge range of Green Onyx reserves, Pakistan is considered really lucky among few of the countries worldwide because of the existence of a huge range of Green Onyx reserves. Actually, Balochistan province of Pakistan is the place having the heavy resource of onyx is found. What is a or an onyx countertop made of? Green Onyx apparently an attractive type of stone, that gives a stunning and it’s placement is enough to attract attention with wonder. Countertops made of green onyx gives a beautifully stunning look moreover place gives a glamorous view. 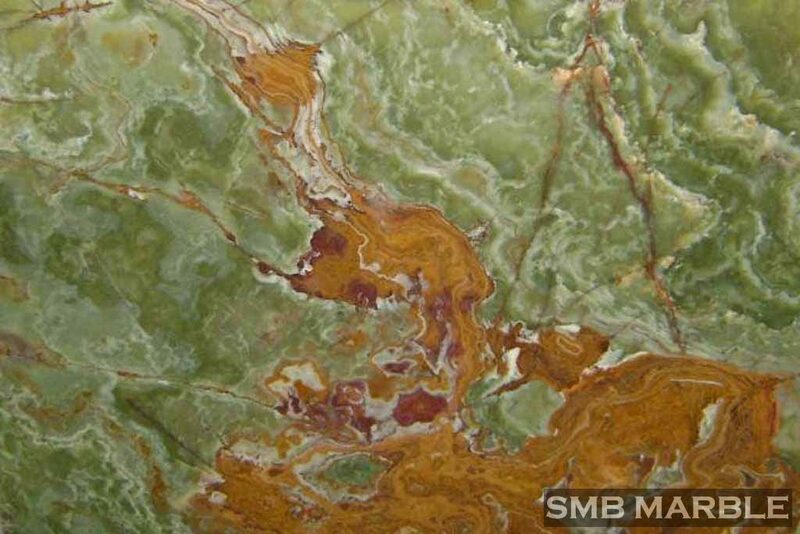 Green onyx slabs are selected by individuals by their color appropriateness and veins color. Customers usually require Onyx Slabs, tiles, and blocks of their desired sizes. It’s specialty of SMB marble that we prepare orders with devotion and deliver products by caring of measurements and finishing. Dark Green Onyx Slabs for export sold per square foot or meter. Thickness: 2 and 3 cm OR 20 and 30 mm, based on the characteristics of the materials. Blocks form of Green Onyx stone is delivered measurement scale is Ton. these ratios are also dependent on the material’s characteristics.